After this, Chantal Mathieu’s programme of French and Spanish repertoire was very warmly received, with no fewer than three encores and a packed-out hall. Many thanks to Chantal for being our guest at this event, and also for her intensive masterclass the following day. This ran alongside two other masterclasses, given by Maria Bîldea (Romania / Greece) and Viktor Hartobanu (Romania / Germany), and reflecting the festival’s strong commitment to educational opportunity. The classes were free of charge for students to attend, an important hallmark of accessibility which we endeavour to foster at our own events. We were also treated to a concert of student talent – “Tinere speranţe” – which was a glowing testimony to the serious pedagogic work of Ion Ivan-Roncea and his colleagues. 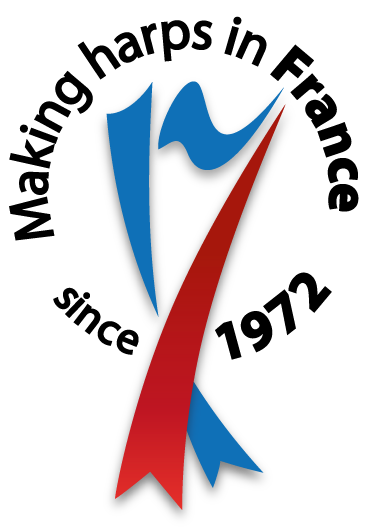 Congratulations to Ingrid Roman, Daria Batschi, Ersilia Mikrou, Andrei Olaru, Electra Peleki, Alice Hristodor, Adriana Cîlţea, and their professors Miruna Vidican, Maria Bîldea and Ion Ivan-Roncea. It takes a secure teacher to take to the stage after their students have played, and it was also impressive to see this happening on a big scale in Bucarest. Miruna Vidican performed a virtuoso solo programme of Renié, Grandjany, Hasselmans and Tournier on Saturday afternoon, after the educational events had finished. 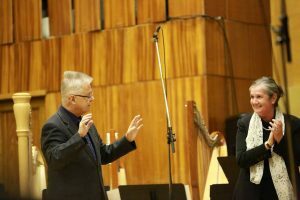 She was joined in this concert by Ionela Brădean (harp) and Gabriela Petecilă (flute), who gave a lovely rendition of the Rota sonata, and also a flute and harp sonata by the Romanian composer Carmen Petra-Basacopol (b. 1926), which I hadn’t heard before. On Saturday evening, Ion Ivan-Roncea gave a lovely recital with his daughters Ioana Nicolescu (harp), and the violinist Ștefana Ivan-Roncea. 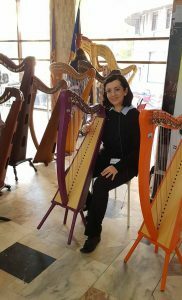 With works by Purcell, Respighi, Josef Blanco (Concierto de dos arpas), Saint-Saëns, Fauré, Piazzolla, and Szekely’s Bartok transcriptions, we were able to benefit from the musicians’ artistry and experience in important harp repertoire works, less familiar pieces, and also keystones of classical repertoire in general. The balance was excellently-judged, and inspiring and extremely satisfying to listen to. On Sunday, October 28th, we enjoyed three more recitals. 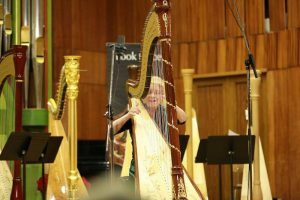 The first, for harp solo shared by Rozalia Pataki and Iuliana Bolgari, focused on classic harp repertoire – and also the Balada by the Romanian composer Stan Golestan (1875 – 1956), which is beautiful and deserves to be performed more often. After this, Roxana Moişanu (harp), Mladen Spasinovici (cello), Rafael Butaru and Cătălina Cîrciu (violins), Cătălina Filipescu (viola) and Cătălin Răducanu (piano) gave a fantastic chamber music recital. Their programme comprised a trio by Dussek and a quintet by Hoffman; William Lloyd Webber’s nocturne for piano and cello, adapted for harp by Roxana Moişanu, and a quintet for piano and harp, accompanied by violin, viola and cello, in G minor op. 142, by Ferdinand Ries. This last piece was a revelation: we could have been listening to Beethoven, and indeed Ries was Beethoven’s pupil. International competition repertoire-deciders, take note: when you get to your chamber music round, all is not lost. 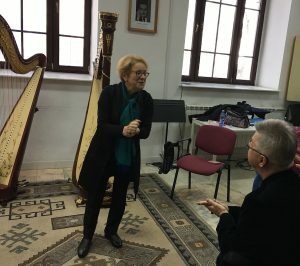 The final concert of the festival was given by Maria Bîldea, one-time distinguished student of Ion Ivan-Roncea, now Principal Harp with the National Radio Symphony Orchestra of Athens. Her flute and harp recital with Greek colleague Marilena Dori was also a just blend of key repertoire (BWV 1031, Doppler Casilda Fantasy), what should be key repertoire (Lowell Liebermann’s marvellous Sonata for flute and harp, op. 56), and new ideas – another chance to hear the sonata by Carmen Petra Basacopol, and finishing with Maria’s own arrangement of the Arma/Bartók Suite paysanne hongroise. A huge thank-you to Ion Ivan-Roncea, Roxana Moișanu, Iulia Calei and the National University of Music for such fine days in Bucharest. We were particularly inspired by the markedly high level across the board – every concert was a pleasure to hear, and a source of new ideas and impulses. We cannot wait for the next edition!